When we think of neutral colours we tend to think of white and beige, and they somewhat lack character and drama in the room but this is not true. Although these colours are very simplistic and calm, they create a beautiful blank canvas in the home for which allows you to further develop a base foundation and bring in other elements such as pattern and texture. Neutral colours are great for creating a base for the overall design, they can also be used in correlation with each other to create a relaxed harmony within the home and cohesiveness. A great quality of neutral colours is that they pair well with almost anything which makes them very versatile and desirable. This being said, it can be difficult to choose the right neutral for a space as there are so many to choose from, each colour having a slightly different undertone. Below are some of our favourite colours that work exceptionally well in almost any space and still make your home warm and inviting. 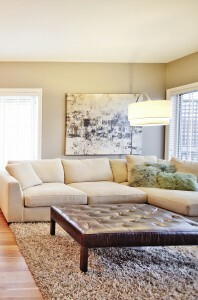 Revere Pewter – Benjamin Moore – this colour acts as a perfect balance of grey and beige and looks great in any setting. It also has a slight green undertone and creates a bit of an earthy feel to it. It renders beautifully and creates a warm glow throughout a space. If you’re looking for a colour that goes with almost everything, this is it! Plaster of Paris – this warm grey tone is a part of the lovely Benjamin Moore full spectrum collection. Being a part of this collection means there is a particular recipe to each colour that allows it to be richer, fuller and more vibrant. These colours such as Plaster of Paris will render differently in each room/space so always be sure to test a swatch first before going ahead with painting the rest of the room. This colour offers a subtle boldness and renders as a rich lather on walls. I have this colour in my own home in my office and absolutely love it! 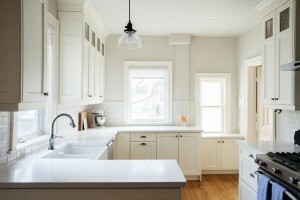 Sea Salt – Sea salt is also a part of the full spectrum collection by Benjamin Moore. It offers a warmer tone while keeping a room calm and at ease. 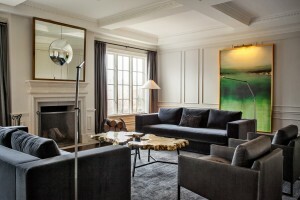 It gives off a comforting feel and provides dimension to a room although it is a simplistic colour. I do love how the full spectrum colours change from day to night and seems to always be changing with a unique richness to it. Pale Oak – Pale Oak is a very timeless colour that is so versatile in every which way. I have used this in kitchens, bedrooms, nurseries and much more as it tends to bring a subtle comfort to a room which is highly desired. Pale oak is a go to colour for me just because it works so well in multiple spaces and you never get tired of it. Of course there are plenty of other beautiful neutrals to choose from however these tend to be my top 4. Now the hard part is deciding which room to start painting now. Happy Spring!